Nothing and no-one can diminish my annual enjoyment of this great country. I’m in the fortunate position of appreciating and loving its innumerable positive aspects (especially its great art and culture) and overlooking the negative ones because I visit it for the tourist season and then return to my home in Australia. Italians don’t have that choice. I spent some two months in my birth home in Friuli, a NE region bordering with Austria and Slovenia and blessed with breathtaking landscapes of mountain (the Julian Alps), lakes and beaches. Great wines and delicious prosciutto (San Daniele) are produced there. But this region, like the Veneto region, is in the grips of structural change. A large percentage of small to medium enterprises have closed and many of the larger ones have moved to E. Europe or even China where labour is so much cheaper. Unemployment and underemployment are on the rise here and in the rest of Italy. For all ages, the unemployment rate is 12.6% (44% for young people, with the rate being higher for males than females). These are some of the ‘challenges’ that Italy was facing at the time of my stay. The weather was of great concern: it rained incessantly (on 25 days out of 31 in July), there were thunderstorms and hailstorms causing flooding, damage and great inconvenience. Worse still, it negatively impacted on the economy. Described by many as a ‘black summer’, tourism bookings at beach and mountain resorts declined by up to 20%; as a result many casual workers did not get the opportunity to work. In many areas wine grapes did not ripen and growers wondered whether they were worth picking. 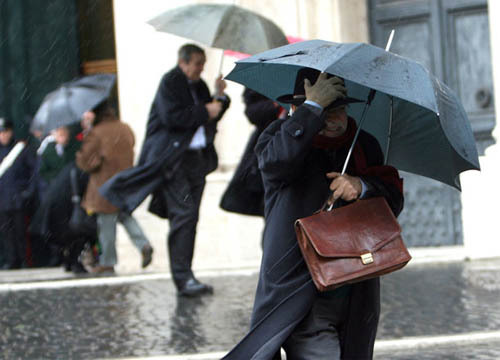 The economic crisis that has been gripping Italy for years did not show signs of abating, quite the contrary: with consecutive negative growth data for the first two quarters of the year, Italy was technically in a recession. Politically, the young PM Matteo Renzi made all the right noises about widespread reforms, but he does not have a majority in Parliament and is therefore dependent on the vote of Forza Italia to carry legislation. (Forza Italia is a centre-right party headed by Berlusconi who, while no longer in Parliament because of a criminal conviction, still exercises power through his party). Renzi has many enemies even within his own party (the centre-left Partito Democratico) especially the old Communists. Some of Renzi’s proposed reforms are structural (eg he wants to abolish the Senate as a house of review but give the reduced number of senators, most of whom would represent regional assemblies, other tasks); others focus on better schooling, yet others aim for greater labour market flexibility with a view to increasing job opportunities for new entrants. Comedian Beppe Grillo (head of the Movimento 5 Stelle but unelectable because of a criminal conviction) still shouts at public meetings but shuns interviews, and continues on his path of knocking the status quo and reform proposals while not being prepared to negotiate with the Government on any point. He has lost ground electorally but his party still won 21% of the vote at the 2014 European Parliament elections and is a thorn on the Government’s side. Boat people keep arriving from Africa and Syria: 61.500 landed in the first six months of 2014 while it is estimated that over 10,000 have drowned in the Mediterranean since 2008. Mare nostrum is a humanitarian Government initiative aimed at using Navy boats to rescue migrants in peril as their rickety boats approach S. Italy. Italy has officially asked the European parliament to share in the burden of dealing with the arrivals and only in mid October it started to get some indication of a preparedness to do so. Many Italians are sick and tired of the never-ending arrivals. Doing it tough themselves, they feel that the new (uninvited) migrants/refugees should not be allocated Government funding ahead of them. Alitalia was in the process of being partly sold to Etihad, with the latter acquiring 49% of the shares and basically rescuing the Italian carrier from very deep debt. 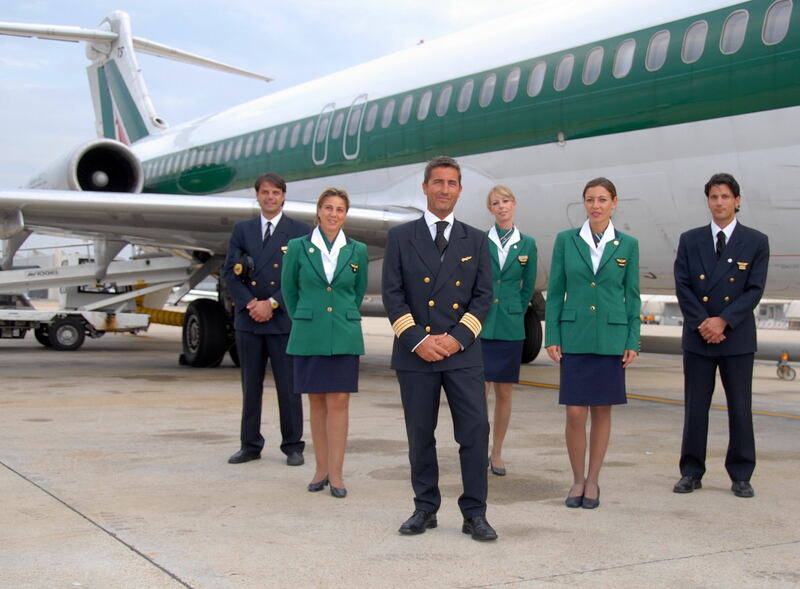 The partnership would offer direct flights from Abu Dhabi to Venice, Bologna and Catania. Venice station has been refurbished BUT not to the benefit of train passengers. There is NO allocated space for passengers waiting to board trains – all available space has been given to commercial activity. Exhausted passengers are forced to sit on the floor along the large passage areas. When I complained, I was told that they intentionally did not set aside a waiting room because it “would have been filled by smelly dirty homeless people, in which case passengers would not have wished to use it”. I found this justification pretty odd. I also had many positive experiences. 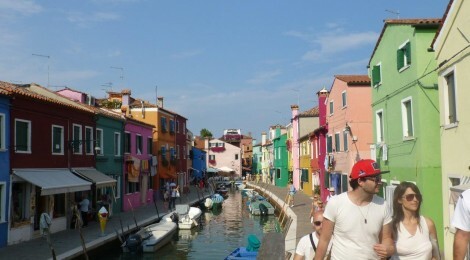 For instance, I visited the Venice Biennale of Architecture and the Venice Film Festival and took a vaporetto (water bus) ride on the Laguna to the gorgeous island of Burano – a very enjoyable outing. I also saw (again) Giotto’s work in the Cappella degli Scrovegni in Padua, and attended the opera Aida at the Arena di Verona – the opera was unfortunately cut short due to a sudden downpour. On the equivalent of ABC TV I saw the Australian drama Miss Fisher’s Murder Mysteries. It was really strange to hear Italian dubbing and the use of what I considered some ‘wrong’ voices. Italians can still enjoy themselves, especially outside the major cities. In my region alone there were sagre (festivals) for all sorts of reasons, apart from the religious ones (eg our Lady of the Assumption): frogs, geese, cheese, prosciutto, asparagus, blueberries, apples, potatoes…. At these festivals there is live music and dancing as well as eating and drinking. But organisers claim that fewer people are now eating out. A few large companies in Friuli are still doing very well. One of the really large ones that has not moved elsewhere is Cimolai which manufactures large-scale metal infrastructure such as the Olympic Stadium in Athens and the National Stadium in Warsaw. Cimolai employs 2500 people. Australia in general does not figure in the news in Italy but people know about it from TV shows and documentaries and are fascinated by this continent. Indeed interest in Australia is intensifying especially among the young, and I was repeatedly asked how people can migrate here. I did however read one negative article in the French newspaper Le Monde in which it was reported that Australia intended ‘selling’ its refugees to Cambodia. Rather embarrassing. It’s when this sort of thing happens that I think it’s best not to be talked about than to be talked about! Ciao Italia – ci vediamo l’anno prossimo!